With a 400,000 coin top payout (which would be worth £200,000) the Super Eighties slot machine is definitely one you should check out. There’s also a very lucrative free spins feature which will re-trigger itself and pay a x2 multiplier on all winnings! Super Eighties is one of several installments of this decade-themed series (Funky Seventies and Groovy Sixties are the others). It is a 5-reel, 40-line game and it looks pretty radical, man. If you grew up in the Eighties, then you’ll soon recognise the theme is right on with the title, from the music playing to the symbols that appear, even the style of the poker symbols works. Although the music might not be what you listened to growing up, it’s definitely Eighties. This totally takes you back to the days of glitz, glamor, excess, and that time when MTV was new and it actually played music videos all day and all night. 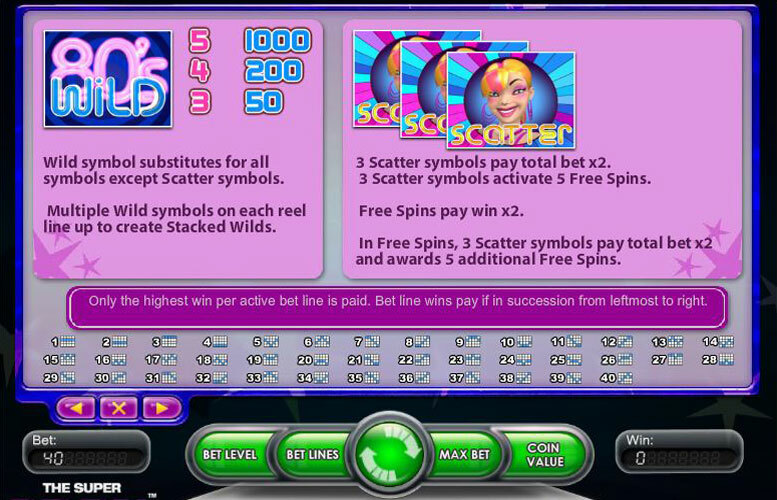 There is no bonus game in Super Eighties, but there is a Scatter which triggers free spins if you get 3 of them on the reels and they can be re-triggered multiple times. It also features a Wild and it is stackable. Anywhere from 1 to 4 Wilds may appear on a single reel, unlike other games in which stackable Wilds only come as a special. Get out the Aqua Net for your hair and hop into your Corvette or Delorean and let’s ride! The top win for Super Eighties is 1,000 coins how this is multiplied by your bet level and you can double it during the free spins rounds. Long story short… if you’re playing on the max bet level and spin in the Super Eighties logo during a free spin round you’ll walk away with 400,000 coins. At max coin value that’s an impressive £200,000! Remember all wins are multiplied by your bet level which on this slot range from between 1 and 5. Eighties Girl (Scatter) – This young lady is a smiling girl with makeup, lots of earrings, and a hot pink streak in her hair. Payout for this symbol only comes if you get 3, and you get double your total bet, plus 5 free spins. You can re-trigger multiple times during, which you’ll see as the free spins remaining just goes back up again. Each re-trigger also pays out double your bet. Red Corvette – this doesn’t look exactly like a Corvette, but that may be due to copyright. Anyway, 5 of these red speed machines pays out 400 if you get 5 on a payline and 25 for 3. Cell Phone – This cell phone is from the later Eighties as you’d see if you play this game, and it calls up 400 for 5 on a payline and 25 for 3, just like the Corvette. Walkman – This first-generation walkman played an ancient medium of music called cassette tapes. They blast out the sound of 250 for 5 on a payline and 20 for 3. Atari Joystick – Again looks slightly different than the real thing, but if you were an Eighties kid, that single button let you know it was Atari. This was the special stick, with an extra firing button on top of the stick. You get 250 for 5 on a payline and 20 for 3. Pink High Heels – Walk up a prize of 150 for 5 pairs of these shoes on a payline and 5 for 3. Skateboard – Although it began in the 70’s, skateboarding really took off in the Eighties. Grind your way to 150 for 5 on a payline and 5 for 3. Ace – This neon Ace pays out 100 for 5 of a kind on a payline and 5 for 3. 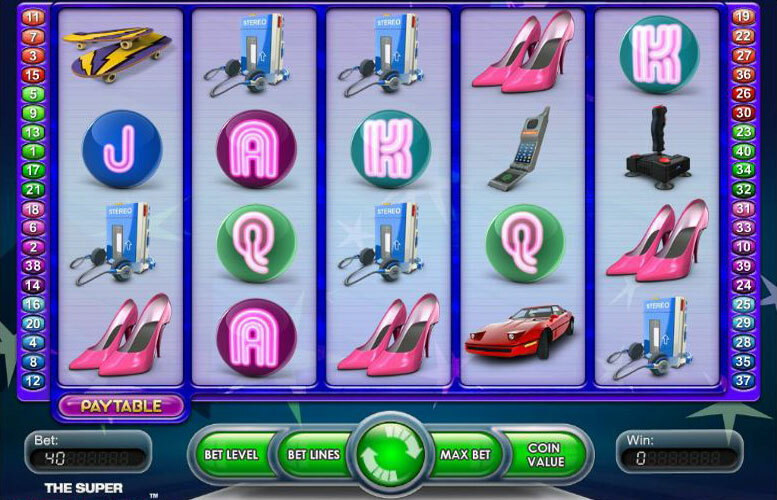 King – 100 is the prize for 5 neon Kings on a payline and 5 for 3. Queen – 5 of these neon Queens pays out 100 for 5 on a payline and 5 for 3. Jack – Again, 100 is the prize for 5 on a payline like the Ace, King, and Queen, and 5 is the payout for 3. Now, we’ll check out the betting limits. Just a recap: there are 40 paylines you can bet on and you can bet from 1 to 5 coins per line (by altering the bet level). The coin values you can bet are 0.01-0.50. 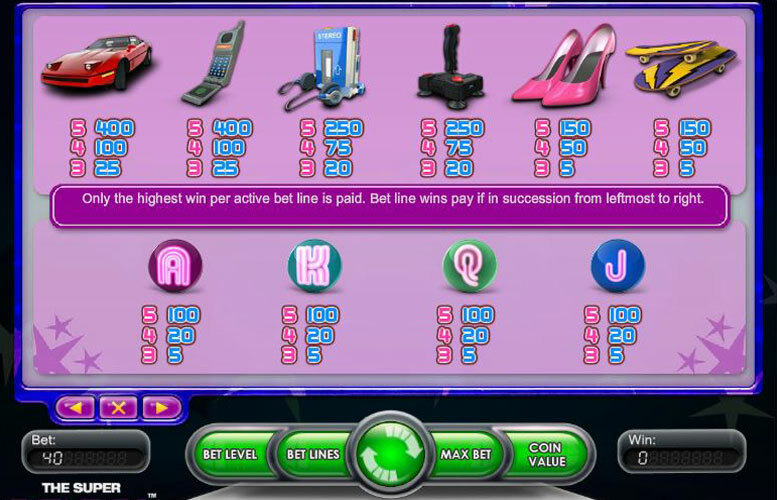 With all lines bet and a bet level of 5, your total maximum bet per spin is £100 or 200 coins at 0.50. Overall, it’s a pretty enjoyable game, especially if you were an Eighties child. Even if you weren’t, it gives you a small glimpse in the culture and style of the 19Eighties. As always, have fun and good luck. This game has a rating of 4 / 5 with 216 total reviews by the users.